Remembering our dear friend Ron Huff as we prepare to celebrate his life and home going at his upcoming memorial service. We hope you enjoy this excerpt from our Homecoming Magazine archives. Ronn Huff is a treasure to the world of gospel music in many ways. His faithful behind-the-scenes role as an arranger has made many artists and songwriters shine, putting songs in musical settings that took them from good to great, or from great to greater. He began his career as a church choir director, serving as a minister of music in Denver, Colorado. There, he arranged two books of hymns, Celebration: Music for Festival Choir and Celebration II which both became successful. In 1973, he arranged and directed a collection of Bill and Gloria Gaither’s songs into a now-renowned musical known as Alleluia, A Praise Gathering. That musical became the first Christian recording ever to receive an RIAA Gold certification, with more than one million records and books sold. Huff then went on to arrange a much-loved Christmas musical of Gaither songs called His Love, Reaching. Bill and Gloria remain grateful for the indelible mark Ronn made on their music, not just on those first two musicals but on many other recordings in the years that followed. Many other artists with whom Ronn has worked over the years would agree. His mark of excellence has been made on both sacred and mainstream recordings by Faith Hill, Charlotte Church, Amy Grant, Celine Dion, Jewel, Martina McBride, Alison Krauss, Sandi Patty, John Michael Talbot, Keith Urban, George Strait, Clint Black, Lonestar, Boston Pops and the American Boy Choir. 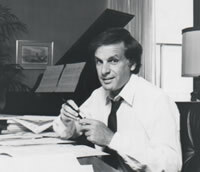 Ronn also held the position of producer and principal conductor for the Nashville Symphony from 1994 until 2002, when his battle with Parkinson’s forced him to limit his activities. In 2005, he was inducted into the Gospel Music Association Hall of Fame as a non-performing member. His musical accomplishments are impressive, yet there is more to Ronn Huff than his great work. His humility, integrity and kindness have made him a stabilizing force among his peers, as has his 54-year marriage to Donna. The couple married on August 29, 1957, when Ronn was 21 and Donna was just 19. He notes that one of their favorite songs is, “(They Tried To Tell Us We’re) Too Young.” This sweet couple has stood the test of time in every way. The ripple effects of Ronn Huff’s life and work will be felt for eternity, and we are grateful for his lifelong friendship and servanthood to gospel music and the gospel music community.